Although we will be milking our cows and caring for our dairy cattle everyday of the Labor Day weekend,it is still a time to celebrate the seasons of change. While you may be planning the weekend trip to visit family, the football game or make the last summer outing to the lake, I'm celebrating the fact that today I finally found okra in my garden. Even though okra thrives on hot weather, I really wasn't sure I would have any okra to harvest due to the excessive heat,drought and the insects that come with it. For weeks I have watched for blooms and hoped the plants could overcome the summer stress. Finally, blooms appeared this week and just like magic--okra! Sometime during this weekend, I hope to have a mess (that's Arkansas talk) to fry for the family. I haven't planned my menu for the weekend but I'm sure it will include grilling hamburgers or steaks to go with my okra. Seasonal celebrations also include recipes that are quick and easy to prepare like BBQ-Ranch Quesadilla Wedges. Prepare stir-fry pepper blend with diced onion added and heat barbecue beef according to package directions.While vegetables and beef are cooking,mix barbecue sauce and ranch dressing in small serving bowl; set aside for dipping sauce. Repeat for total of 4 quesadillas. Spray large skillet or counter-top grill with non-stick cooking spray. Cook each quesadilla for 3 minutes on each side or until golden and cheese is melted. Cut into 8 wedges; serve with barbecue-ranch. 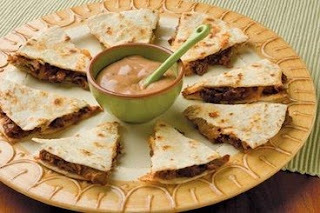 For fajita-ranch quesadillas, substitute chicken strips for the shredded beef. Mix light ranch dressing with salsa instead of barbecue sauce for dipping. You can find other great recipes for your family at http://www.midwestdairy.com/. While I'm enjoying my fried okra and working on the farm this weekend I hope you and your family enjoy a dairy good Labor Day! thanks so much for stopping by during my SITS Day. I hope you will visit again sometime.